Just curious if anyone was going be in the Exumas around mid June, hoping to go all the way down to Long Island and back up. I really wanna see that blue whole LOL. I'm planning a thee month cruise to the Turks & Caicos from Palm Beach County in May and I'm planning to also cruise thru the Exumas. At this time I'm not sure when I'll be there. My last cruise to the Exumas was 18 years ago and it was pristine. Oh ok, three months is a lot of time, have fun! Well plans have possibly changed, we might go to the abaco's for a month and stay in Spanish and do small trips from their. also might have a buddy boat ( Hatteras 60).Last years trip (the pic) is when we fell in love with the N47. We may see you there, Oliver. Our plan is to leave for the Abacos about mid May for 3 weeks or so. Great! We also might spend some time in Treasure and branch out from there. Did you know treasure doesn't charge by the gallon, they charge by the day. We don't spend much time at Treasure Cay, although it has one of the most beautiful beaches in the world. I think Thursday night is pizza night at the restaurant, and it gets noisy as hell. Have them give you a slip a little removed from that action. Have you spent any time at the Green Turtle Club? You can get a slip or mooring ball there. Here is a shot of the marina, pool and restaurant at Treasure Cay. This was in 2010. We don't spend much time at Treasure Cay, although it has one of the most beautiful beaches in the world. I think Thursday night is pizza night at the restaurant, and it gets noisy as hell. Have them give you a slip a little removed from that action. Have you spent any time at the Green Turtle Club? You can get a slip or mooring ball there. 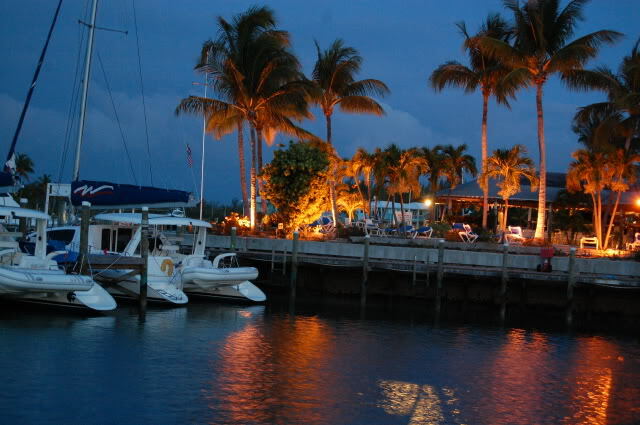 Here is a shot of the marina, pool and restaurant at Treasure Cay. This was in 2010. Yeah we've Been to GTC, it's beautiful there and New Plymouth is nice little town not too far away. The only thing is I don't thing we'll be going into GTC because of our draft, might anchor out front take the dink in thought. The last time we went to Treasure it was dead as rock, it was us and a couple boats, it was fun to watch the heat finals on a big projected screen by the pool. So the GH didn't happen? No, I chickened out. Thought it needed too much work and I didn't feel up to handling all the projects right off the bat. Sorry to hear, another one will come along. Better then spending a lot of money on the boat and then having to put a lot of money into it. I'm going to look at this crazy thing next week. 45' cat with a 21' beam. Draws 2'. Outboards for simplicity sounds interesting if I can afford the gas. Should be a good Bahamas cruiser. The outboards have come along way efficient-wise. My problem would be trying to find a slip! But she's a beaut, wish you all the best. I have a slip arranged here at my local marina that will work, but I do wonder about the availability of a slip that big on the ICW between Texas and Florida, and in the Bahamas. I suppose I can anchor out mostly in the Bahamas but I know I will need a slip from time to time for water and to refuel. Most fuel docks should be fine. With 2 feet of draft and raisble outboards you have a lot of freedom! Man-O-War Marina had a couple of slips wide enough for a cat. On the ICW it will be mostly T heads. When you went to Man-o-war did you see the albury brothers place where they build them? Their nice boats, but crazy expensive! Yeah, in fact Lou has a friend who married one of the Aburys and moved to Man-O-War. Her husband is retired now, and they live in a lovely home on the north end of the harbor. There is a railway there, and two of the older brothers repair boats that they have built. Beautiful woodwork. They picked us up at the marina for a nice visit and tour of the island. You can see it on the "Bahamas 2012" page of our blog.